NovaGlow Stair Marking Range (Class C & D) are manufactured using non-toxic, non-radioactive luminous pigments that absorb ambient light (natural and artificial) emitting a strong visible glow that is best observed in darkness. They have been tested in accordance with DIN 67510 pt. 1 by an independent laboratory and has exceeded the requirements of PSPA class C & D respectively. The material is uniform in appearance in ambient light and also under its own luminance, subject to the excitation source being uniform. 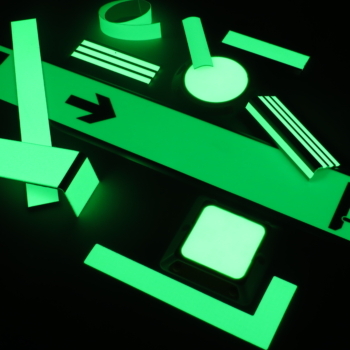 Click HERE to link through to our full PHOTOLUMINESCENT product range.